1 of 4 Heat oven to 350 degrees. Coat two 1.5-liter Pyrex bowls with nonstick cooking spray; set aside. 2 of 4 Whisk together the flour, baking powder and soda, cinnamon and salt. Mix the pumpkin, milk and vanilla in a small bowl to blend. 3 of 4 Beat the butter in a large bowl with an electric mixer until smooth. Gradually add the sugar and beat until light and fluffy, about 3 minutes. Add the eggs, one at a time, beating well after each addition. Add the flour mixture, alternating with the pumpkin mixture, ending with the flour mixture. Beat just until smooth. 4 of 4 Divide the batter evenly between the prepared bowls. Bake at 350 degrees in the center of the oven for 55 to 65 minutes, or until golden and a toothpick inserted in center of cakes comes out clean. Transfer bowls to a wire rack and cool 15 minutes. Invert cakes onto racks and remove bowls; cool completely (about an hour). 1 of 3 Trim the top of the cakes with a serrated knife to make level. Tint the frosting orange with the food coloring. Place one cake layer, cut-side up, on a serving platter. Spread the cut side with 1/2 cup of the frosting. Place the other cake layer on top, cut-side down. Trim any excess to make round. 2 of 3 Spread a thin layer of frosting on half the cake, from top to bottom. Start with the nose: In the center of the frosted area, place 3 yellow or brown M&Ms (see photo) -- 2 on the bottom and 1 on the top -- to make a triangle nose. Place 2 orange candies above the nose, then begin the eyes: Attach 3 yellow candies along the same line as the orange candies above nose, to the left. Then place 2 yellow candies above that row, and end with a single yellow candy. Repeat on the other side of the nose. Below the nose, make an upside-down triangle using 6 orange candies. Make a yellow candy mouth, beginning with 7 candies arranged in a V around the orange triangle. Then use 12 additional yellow candies to finish the mouth. 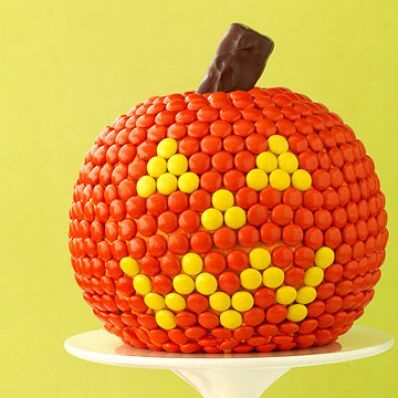 Fill in with more orange candies close together on the frosted area. When that area is covered, spread another area with the frosting and add more candies. Repeat until the entire cake is covered with orange candies. 3 of 3 Cut the candy bar in half crosswise on the diagonal to fashion a stem. Make a small hole in the top of the cake and press the candy bar half, cut-side down, into the top of the cake, for the stem. Refrigerate to firm frosting.